Vacation rental cabin / bungalow. Sleeps 7, 2 bedrooms, 1 bathroom. Dogs allowed. Surrounded by pines and serene blues and greens of the waters, you'll feel like you're truly on vacation! 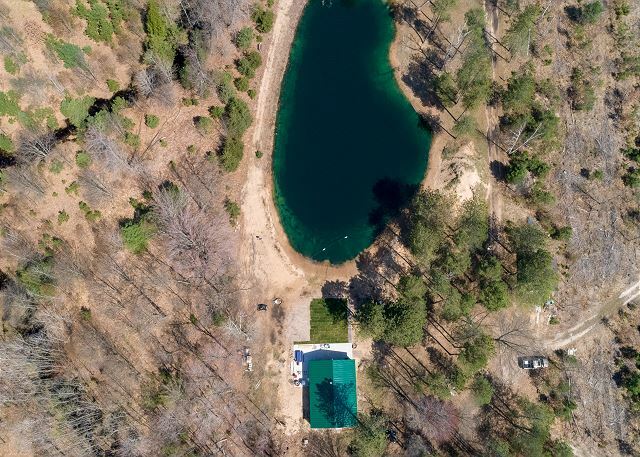 The surrounding property and cabin are a real treat for anybody wanting to get away from the pressures and demands of "real life"
The pond is stocked with fish for fishing, but clean and ready for swimmers! 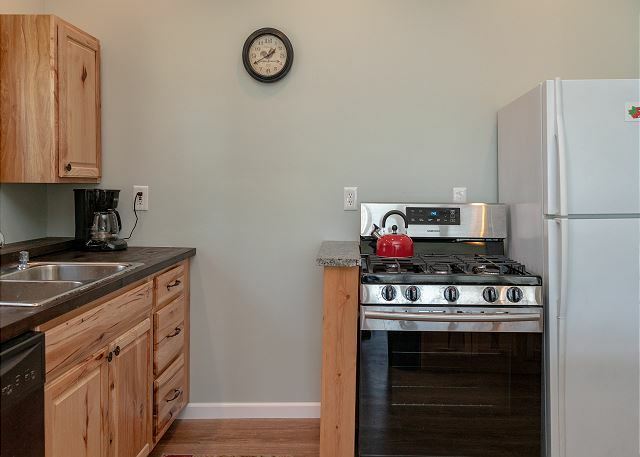 The kitchen is fully stocked for you to be able to prepare delicious home-cooked meals for your family. The Living Room is simple yet comfortable. The couch is a sofa sleeper, allowing for additional guests. The wood-burning stove completes the feel of a modern cabin in the woods. 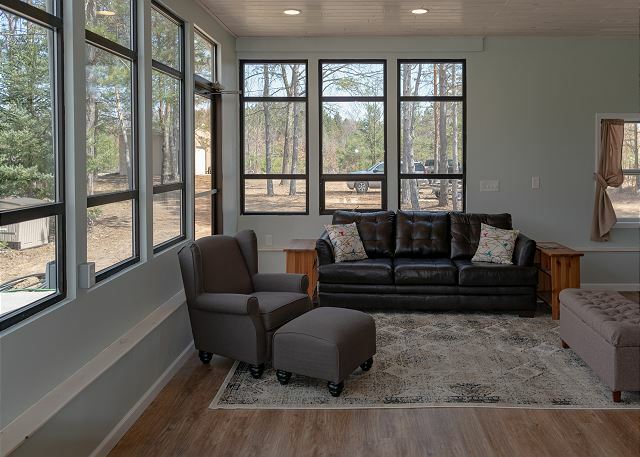 All the large windows throughout the living room gives lots of natural light as well as beautiful views! The Farmhouse style table seats six, as well as an additional three at the counter-top bar in the kitchen. You'll enjoy the open space this home has to offer! 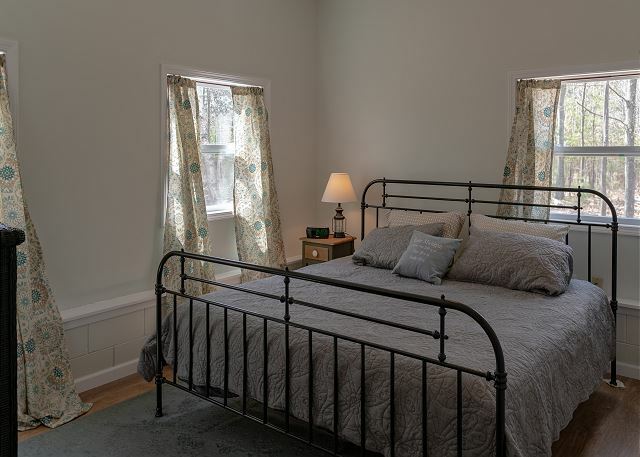 The Master Bedroom has a comfortable Kind sized bed, lots of windows and a large closet. Fall into bed after a day of hiking, exploring, and swimming! 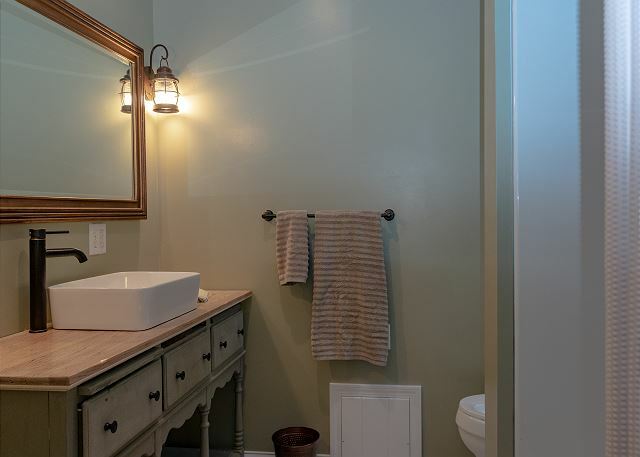 The full bathroom has plenty of counter space, an adorable farm style sink and a tub/shower combo. The bathroom offers a convenient tub/shower combo. 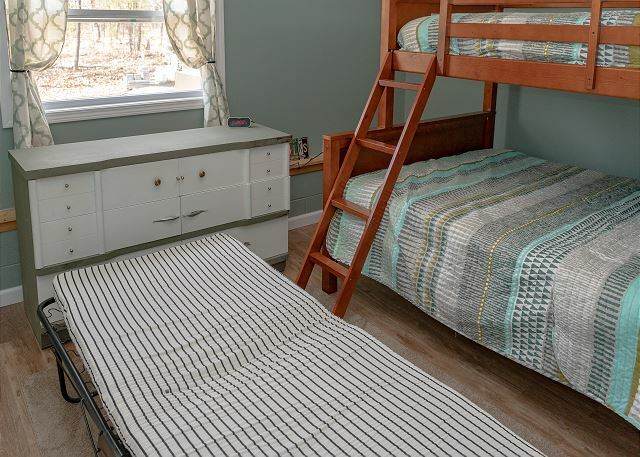 The "bunk room" features a twin over a full, as well as it's own flat-screen television. A roll-away is available to use as an extra twin bed. You will appreciate this brand new gas grill when it comes time to cook up the fish you caught earlier in the day! The fire pit is conveniently located near the house, so trips to get more marshmallows won't be difficult! You will love floating in the treated pond on a lazy hot summer day! The gorgeous blues and greens of the pond are so inviting! When you are ready to get away from the busyness of everyday life and enjoy a simpler pace, this homey cabin is waiting for you. 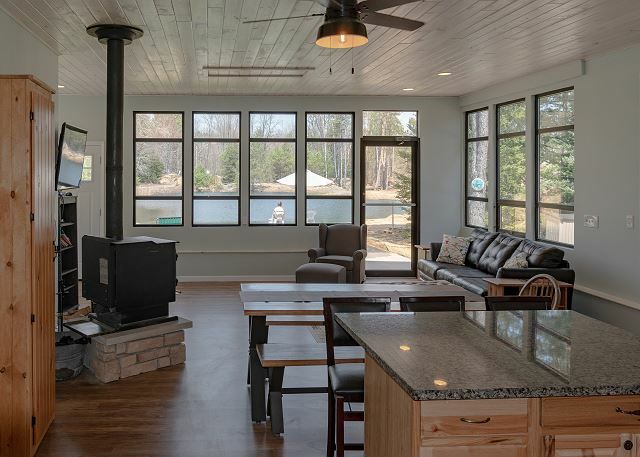 You won't believe how large this cabin feels with it's wide open floor plan, tall ceilings and abundance of natural light from an entire wall of windows. 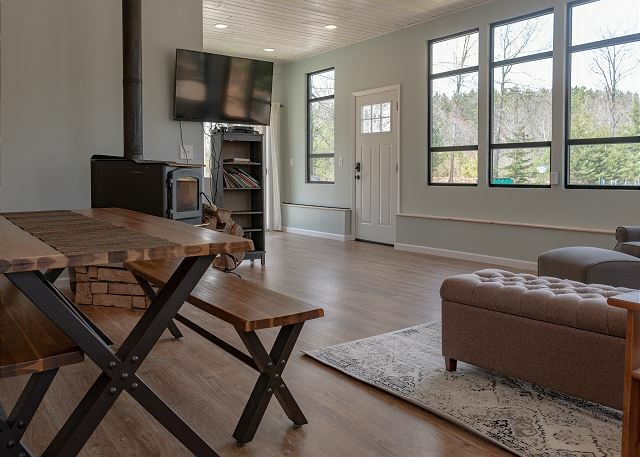 Walking in the front doors you enter the quaint living room complete with sofa sleeper and cozy wood-burning stove. The flat screen television is mounted on the wall and can be seen from every area of the living quarters. The farmhouse style table seats six and is located between the living room and kitchen. A large island with granite countertops and barstools offers additional seating for three more. The kitchen is fully stocked with all cookware and dishes and a large pantry unit is a great place to store all your groceries. Down the hallway are the two bedrooms and bathroom. The first bedroom has a bunk bed with a twin over a full as well as a roll-away bed. Bedroom #2 has a roomy king bed and large closet area. The bathroom is across from bedroom #2 and has a convenient tub/shower combo. The washer and dryer are located in the back of the home with easy access to a clothes line out the back door for that crisp, natural air dried feel for beach towels and such. You are truly "in the woods" here. The long, private dirt road back to the home will make you feel like you are the only one around for miles. 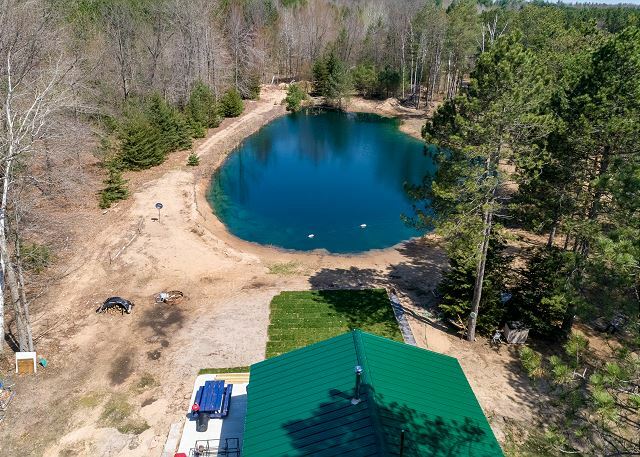 Enjoy the tall mature trees surrounding the property and a treated man-made pond that is ready for swimming as well as fishing! The pond is stocked with bass, perch, and blue grill. 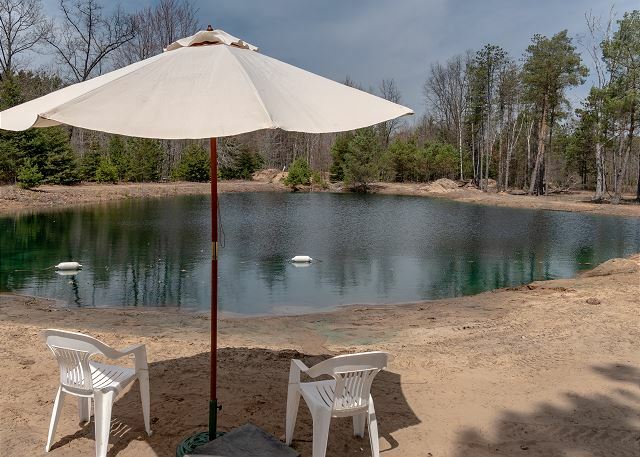 The sand around the pond will make you feel like you have your own private beach. Parking: There is plenty of parking around the property. This condo sleeps 7. Bed and bath linens are provided. 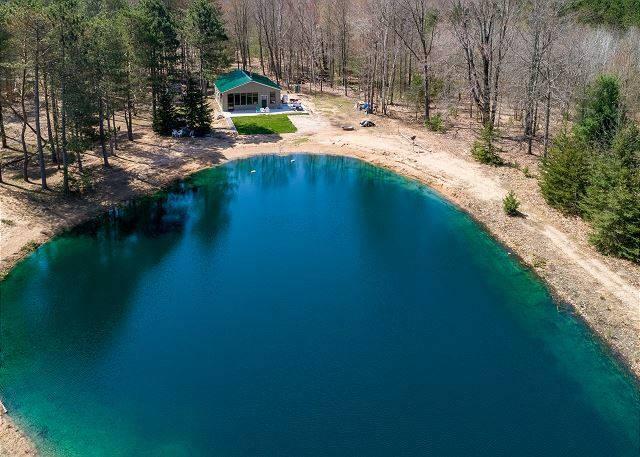 Located 30 minutes from Ludington, and 20 minutes from Manistee you won't be at a loss for things to do. Spend a day in Ludington hiking, exploring the lighthouse and enjoying the shores of Lake Michigan. Step back in time at Historic White Pines Village, or explore the Sandcastle Children's Museum. Manistee is a hidden gem with great restaurant options, boutique style shopping, a unique Riverwalk along the Manistee Channel and out to Lake Michigan, and of course, beautiful beaches. Don't miss an opportunity to visit Nordhouse Dunes Wilderness right in Free Soil, only 12 minutes from In The Woods. 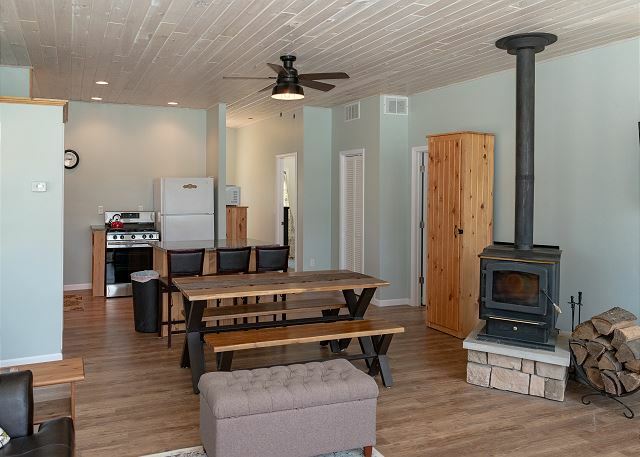 You will want to experience the 6 miles of trails throughout dunes and woods, completing the theme of your stay with surrounding beauty and a slower pace than your typical everyday life.